It’s Friday! That alone is a definite reason to be cheerful today, after what’s been a long and quite challenging week. A week which has seen D getting scared by a cyclist and a potential bolt into the road situation and also (fortunately this doesn’t happen too much) a couple of times when one of the children kicked and hit me. It happens. I’ve moved on. 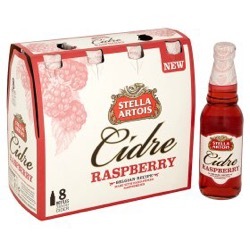 I celebrated the fact it was Friday with a Stella Artois raspberry cidre – absolutely lovely! Sweat. Now I know that ladies or even laydees aren’t meant to sweat, a nicer turn of phrase would be “perspire”, but sweat it is. 1. I’ve hit the gym four days out of five this week and there’s been plenty of sweat forming, believe me! I did a kettlebell class last week and made the mistake of overdoing it on the treadmill and bike beforehand and ended up lasting 15 mins out of 30 and resembling a beetroot. Yesterday I did the whole 30 minutes class and even found that my knees were sweating – very unladylike. Felt it today though. 2. Poor Hubbie has been working on exterior work, working quickly to get certain areas done before the sun gets around. He’s nicely booked up for the new few weeks, which is a relief. 3. D and T have both been practising for their (separate) school sports days. D has been getting very worried about the competitive element of the day – there’s medals! – and at times she’s convinced she won’t win, others she’s told me how she came back from being second in a practice with determination that she would overtake – and she did! The school emphasise that “it’s not the winning, it’s the taking part” and we echo that, but this all seems to be forgotten when it’s the event and there are shiny medals to be won! Quite a few times over the years, D has had a crisis of confidence, hidden under a chair and refusing to step up when she’s called, but eventually she’s got there and done her best – with me standing at the finish line, jumping around and shouting encouragement, then she’ll come down the track at a very fast pace and nearly bowl me over because she’s so focussed on getting to me. It’s all good fun but I am aware that every year brings a bit more speed and muscle power so it’s a bit like being a skittle facing a bowling ball! 4. And I’m sure I’m going to have sweaty moments at BritMums next week. The thing I keep telling myself is that everyone there no doubt had “first time nerves” once and it will be great, good to attend sessions and network. I’m looking forward to being smiley and putting faces to Twitter ids and blog names. Karen Sellers on 12th June 2015 at 8:38 pm. Jeannette on 14th June 2015 at 11:30 am. Blogger Mummy Lauren on 12th June 2015 at 10:23 pm. 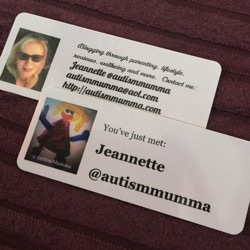 Love the business cards, unusual shape! Sounds like a great week, well done on going to the gym so much! Funny that you had sweaty knees, I went out running last week and found my eyebrows were sweating! Jocelyn (@ReadingRes) on 13th June 2015 at 5:07 pm. Jeannette on 14th June 2015 at 11:29 am.  xOjox on 13th June 2015 at 8:34 pm. Merlinda Little on 14th June 2015 at 12:50 am. Jeannette on 14th June 2015 at 11:28 am.